Erba is a hat and cowl set that is super fun to knit and to wear. You get both in this pattern. The cowl is worked from the bottom up starting with the bottom ribbing, then transiting to the easy slip-stitch colorwork then back into ribbing. Button bands and buttonhole bands are worked last. The bonnet shaped hat starts with an icord edge. Stitches are picked up for the slip-stitch edge worked flat, then transitions to the crown worked in the round. An applied icord is then worked along the bottom edge to finish things off. You may not have worn a bonnet before but the advantages are plenty. These hats don’t mess up your hair like a traditional beanie. You won’t get the traditional “hat hair”. They also cover your ears, keeping them nice and toasty. Plus, they are super cute. I added mini faux fur pom poms to the ends of each tie. You can make your own pom poms if you like, or use faux fur poms here too. I found my poms in the craft store as a key chain. I just removed the hardware and used the poms for my own purpose. The poms I found were on sale and cost $2.50, normal price was $5 for the pair. The new Anzula yarn, Gerty was such a pleasure to use for this project. 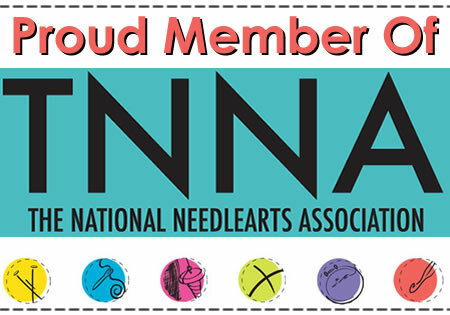 I was honored to get a chance to use this way back in January when it premeired at the Winter TNNA show. It’s a sproingy Targhee wool. The twist makes it bouncy and light and it takes Anzula’s vibrant color palette beautifully. I used Charcoal, Madam, and Paprika for my set, but with Anzula’s huge selection of colors, you have an unlimited palette of colors available to make this set your own. You can find the Erba pattern on Ravelry here.